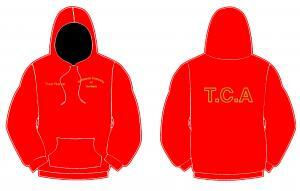 Red pullover hoody with contrast black inner hood. Tavistock Company of Archers logo embroidered on left chest, optional personalisation embroidered on right chest. "T.C.A" embroidered on back in gold.